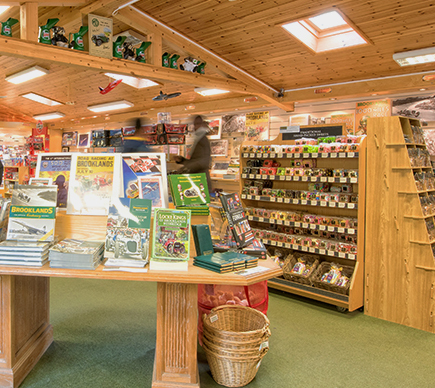 Located at the main entrance to the museum, the Shop offers a wide range of unique souvenir and gift items including books, cards, models, toys and much more - something for everyone. 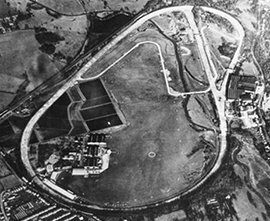 Test Hill was constructedin 1909 as another facility to encourage use of the track for development and test work. 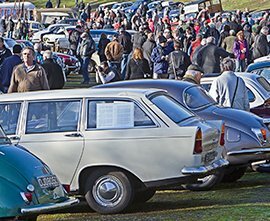 It was used by manufacturers to test both the ability of cars to climb steep hills and also of their brakes to stop them coming down. 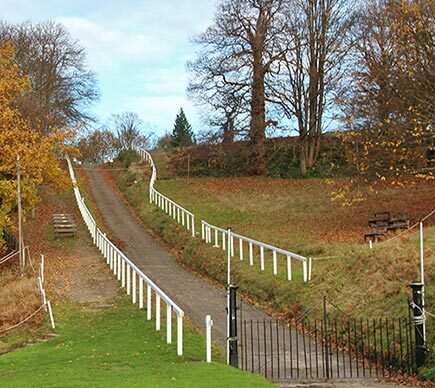 Standing at the top of Test Hill date from 1907 and are undergoing restoration by Brooklands Cars. 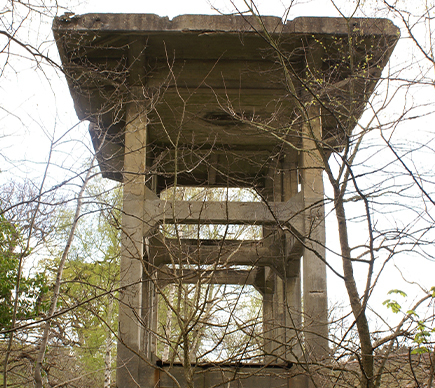 Built to protect the aircraft factory from air attack in World War Two. Awaiting restoration. 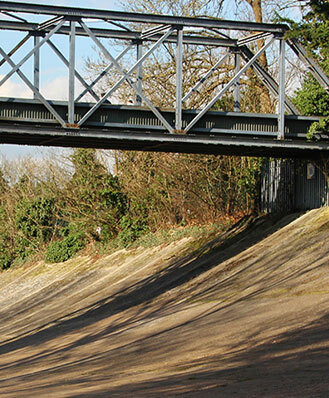 MEMBERS’ BANKING is the steepest section of the Track and reaches nearly 29ft high before descending onto the Railway Straight on the other side of the river. 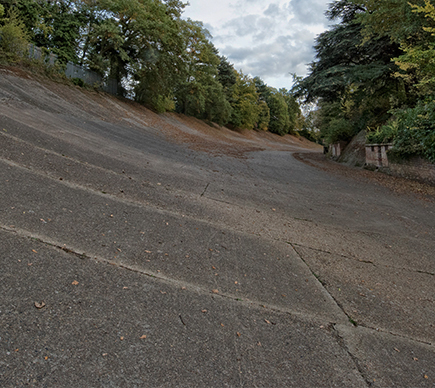 This half-mile section of the Track ran from the Fork to the Members’ Banking and was 100ft wide. 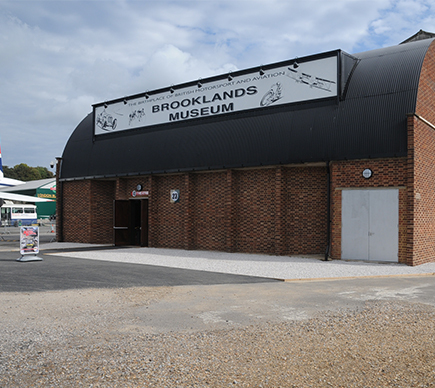 It was also the original location for the Bellman Hangar which was to become relocated as the Brooklands Aircraft Factory. 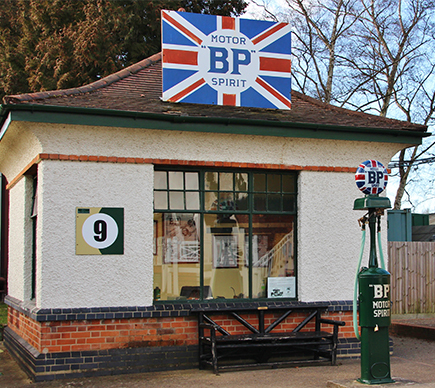 The Shell, BP and Pratts Petrol pagodas were all built in 1922 and supplied drivers with fuel. 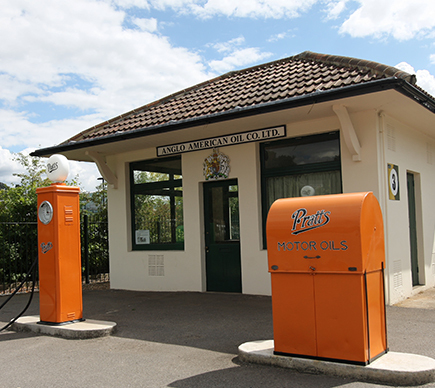 They have all been fully restored to their 1920’s or 30s external appearance. 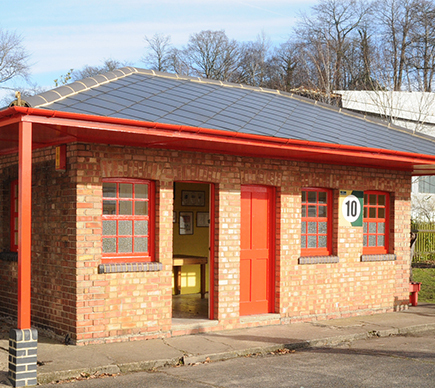 The PRESS HUT was built in 1930 for journalists reporting on Brooklands events. 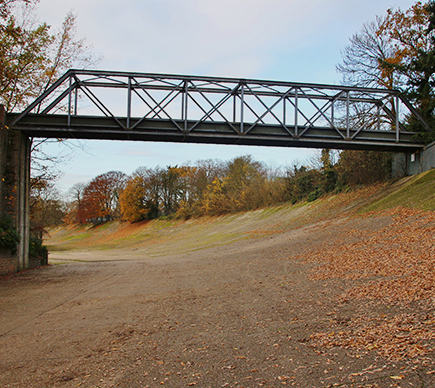 Directly behind it lies a line of Race Bays where vehicles would be checked and waiting before going out onto the Track. 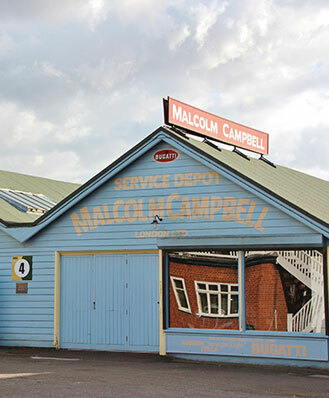 ERA SHED. 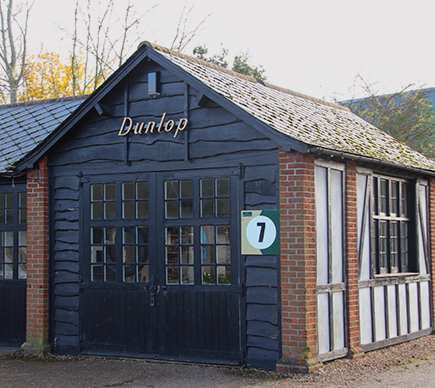 A workshop and showroom in the 1930s, it now houses the Speed Record Exhibition and features the 24 litre Napier-Railton as well as racing motorcycles. 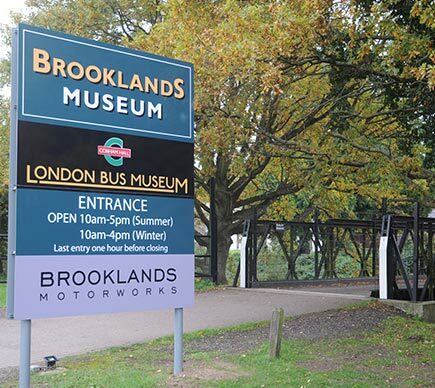 Leads to the Brooklands Cycle Exhibition and Raleigh displays. 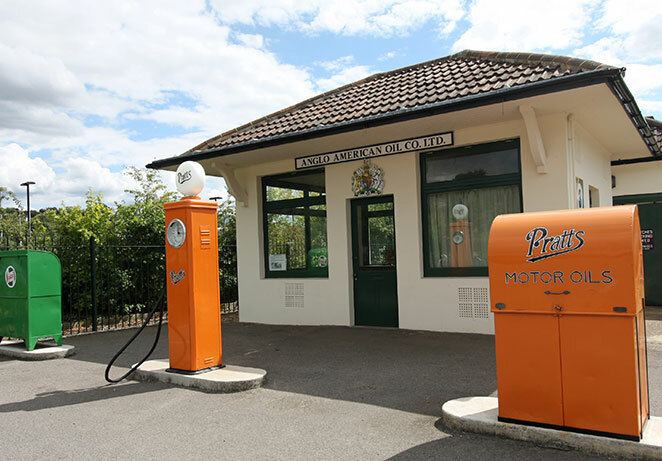 (See more motorcycle history in the McEvoy Shed, behind the Clubhouse). 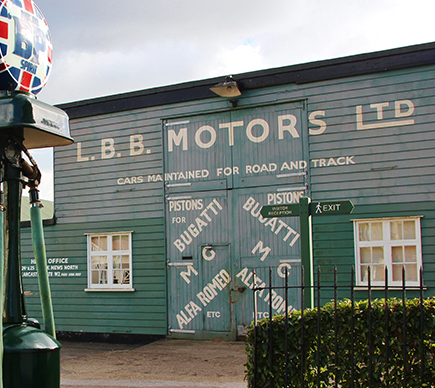 The RACING LOCK-UPS were built as garages to prepare cars for racing. 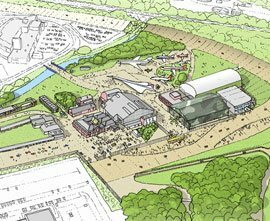 (Access the building via the ERA Shed to see the Brooklands Cycle Exhibition and Raleigh displays). 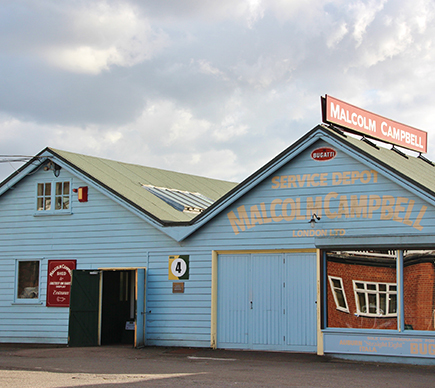 This was Campbell’s workshop and showroom and now contains Brooklands racing cars, memorabilia and displays. 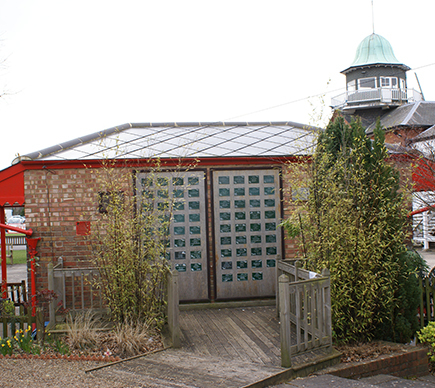 Leads to the ERA Shed. Here David McDonald supervised tyre fitting in the 1920s and ‘30s. 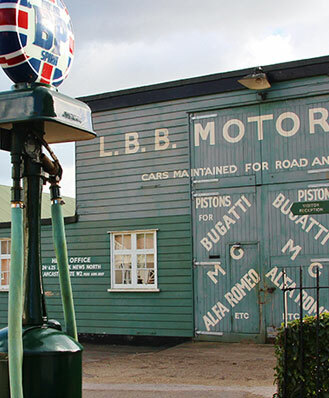 it is now a vehicle workshop. 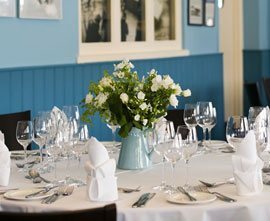 Enjoy the period atmosphere and the evocative room settings including the Ladies' Reading Room, the Clerk of the Course’s Office and the Billiard Room. 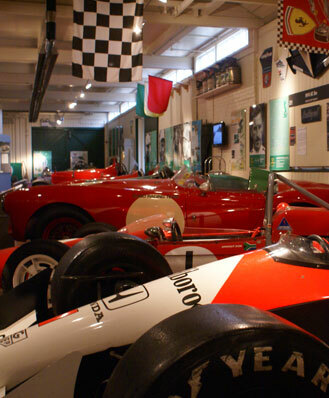 See the displays, exhibits and collections of memorabilia throughout the ground floor of the 1907 Clubhouse. 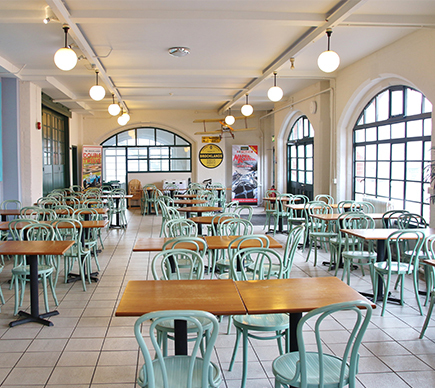 Also located here is the Sunbeam Café, toilets and Visitor Services Information desk. 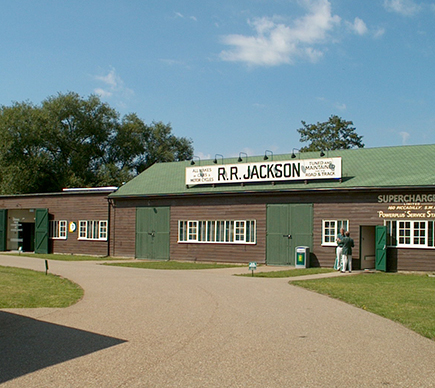 Built in 1930-31 by Robin Jackson to maintain and tune racing cars, it now houses the Grand Prix Exhibition, a mechanic’s workshop and the McLAREN FORMULA 1 SIMULATOR. 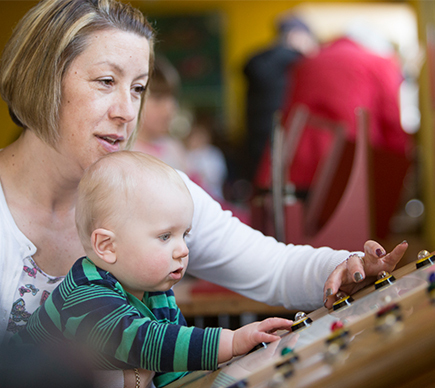 This space is currently closed, apologies for any disappointment caused. 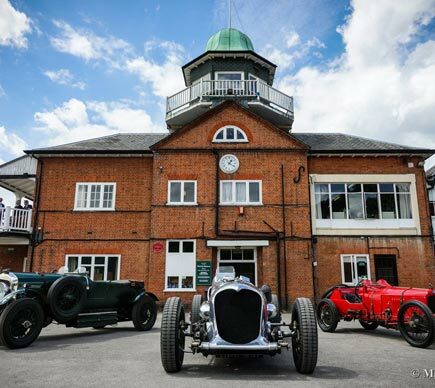 The ‘Garden of Memories’ provides a peaceful corner of shade and colour in memory of the great drivers, aviators and mechanics who helped create ‘The Spirit of Brooklands’. 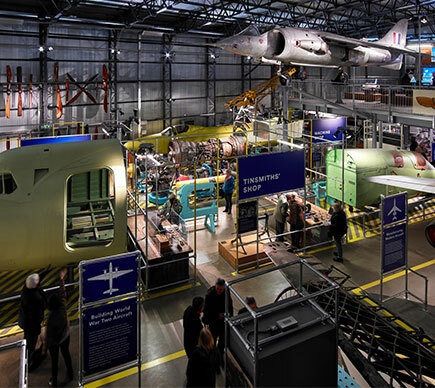 The generations of workers at Vickers, British Aircraft Corporation and British Aerospace who were the driving force of the British aviation industry are also honoured. 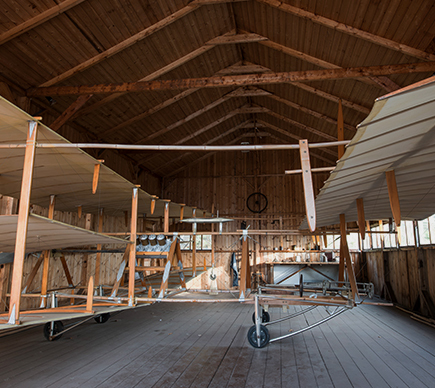 Contains an accurate replica of the ‘Roe 1’ Biplane, the original of which was used by A.V.Roe to carry out pioneering flight trials on the Finishing Straight in 1908. 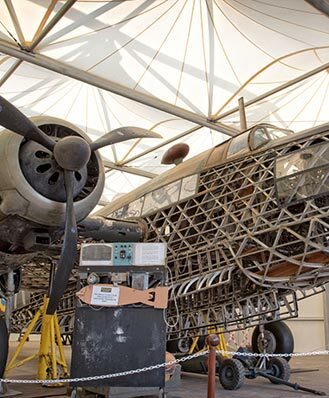 The Wellington Bomber has been moved and the structure dismantled. 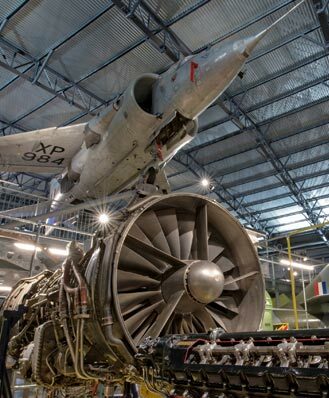 The wellington Bomber is on display in the Aircraft Factory. 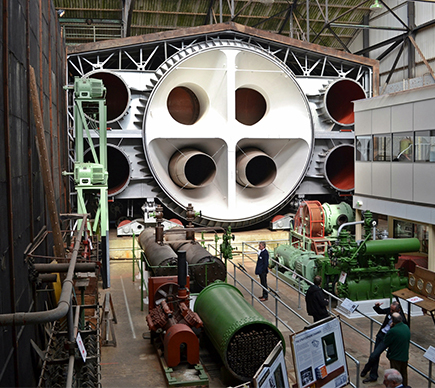 The Stratosphere Chamber was designed under the direction of Barnes Wallis in 1946 to test aircraft and laterly boats, engines and other vehicles by simulating a variety of climatic conditions. 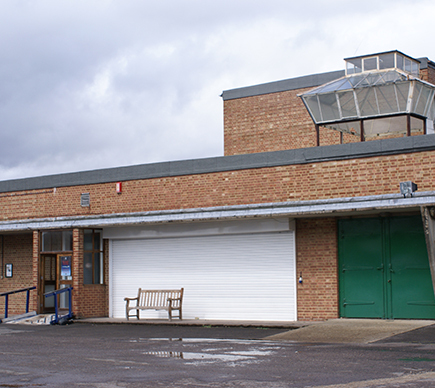 Today it also houses the Aero Engine and Barnes Wallis weapons displays. 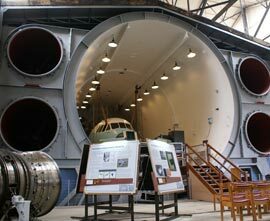 The Acoustics Building was a test laboratory for British Aircraft Corporation products including Concorde parts. 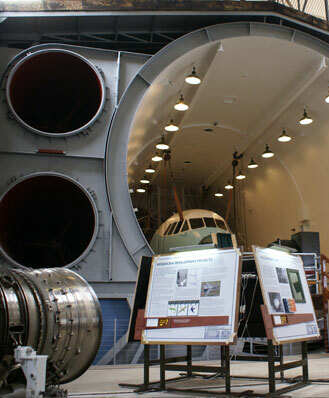 Located at the rear of the building is the CONCORDE SIMULATOR which can be viewed by appointment. 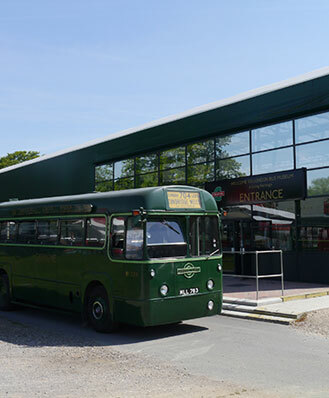 Please ask at the Concorde Ticket Office (see no.21). 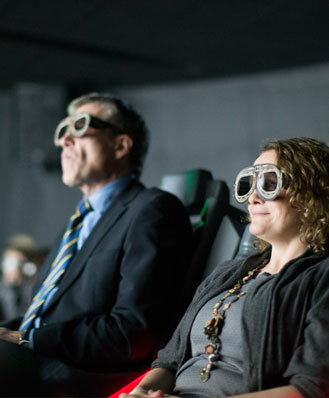 The Balloon Hangar which was once the power source for the wind tunnel used in the Stratosphere Chamber now houses the 4D Theatre and ticket office for Concorde Experience ‘flights’. 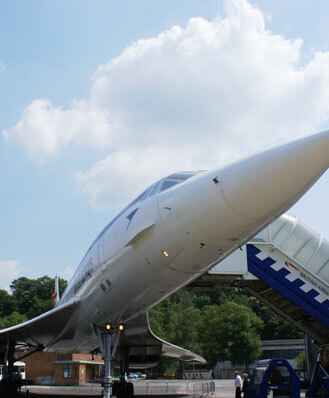 The initial British production Concorde, G-BBDG was the first aircraft ever to carry 100 passengers at twice the speed of sound. 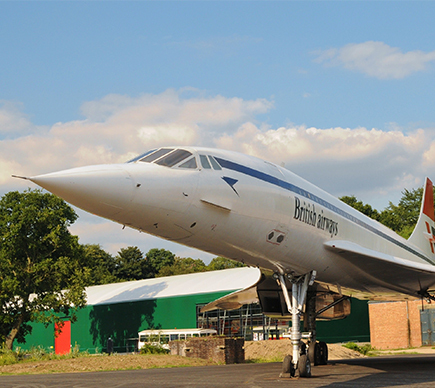 Much of Concorde’s design and manufacture took place at Brooklands. 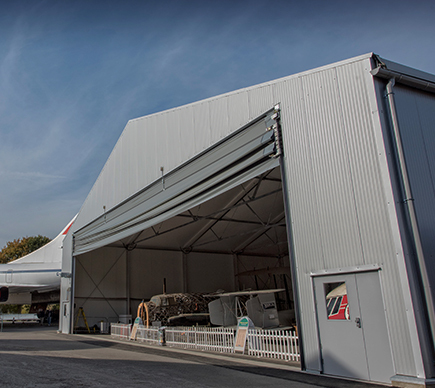 Tickets for the CONCORDE EXPERIENCE can be purchased from the Balloon Hangar. 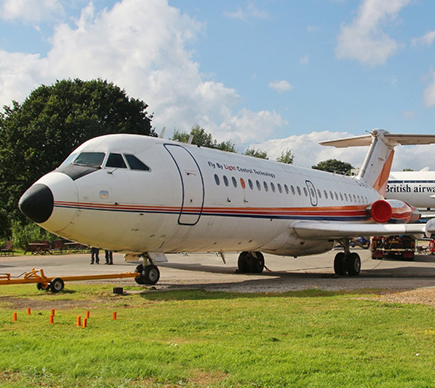 The BAC 1-11 was developed from a Hunting Aircraft Ltd design and was one of Britain’s best-selling airliners. 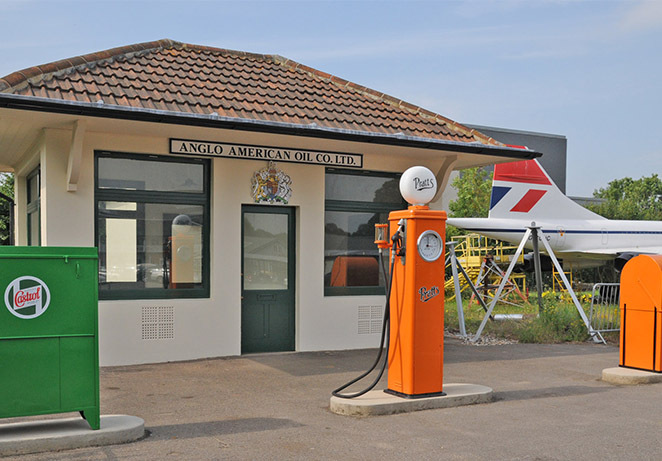 This exhibit was retained by the British Aircraft Corporation throughout its 29-year flying career. During this time it was used as a development and test aircraft. 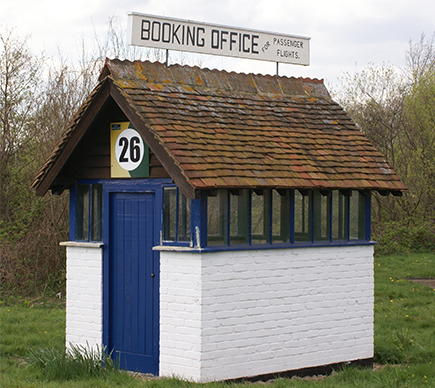 The World’s first flight ticket office was built in 1911 for London booking agents Keith Prowse to sell sightseeing flights around the Track. 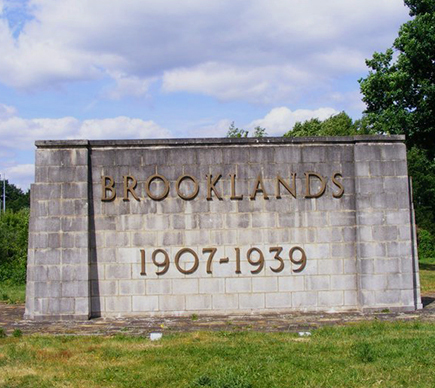 Unveiled by Lord Brabazon of Tara in 1957 to mark the first half century of Brooklands. 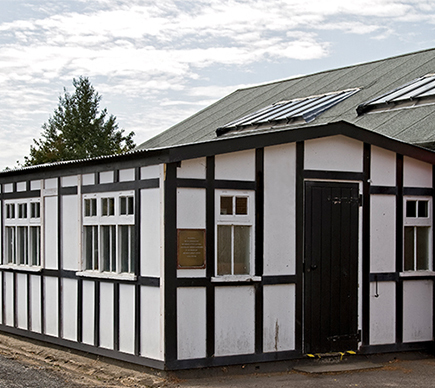 The purpose built pavilion houses the Vickers FB27 VIMY Replica, ‘NX71MY’ which was commissioned in 1994 to re-enact the type’s three long distance flights of 1919-20. 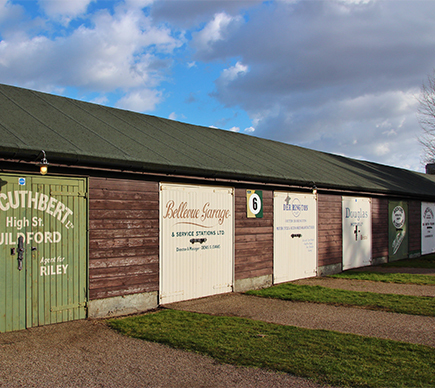 This is the location for the restored Bellman Hangar once it is moved off the Finishing Straight. 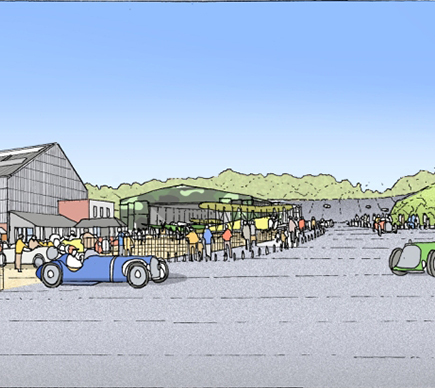 Once re-constructed it will be re-interpreted inside as the Brooklands Aircraft Factory telling the story of aviation production at Brooklands spanning 80 years. 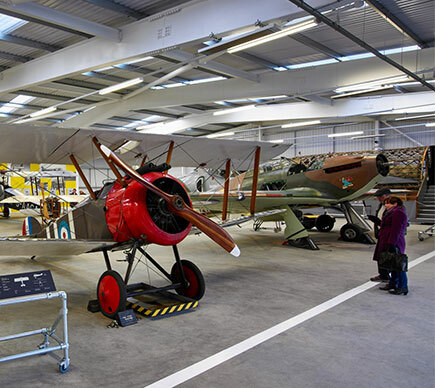 This two-storey building to the rear of the Aircraft Factory will house live aircraft that can be wheeled out for engine run and taxi demonstrations. 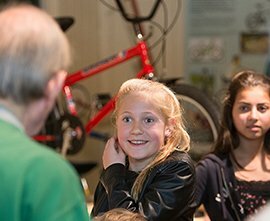 On the ground floor, workshops, research areas and archive stores will be provided for the study and preservation of the collections. 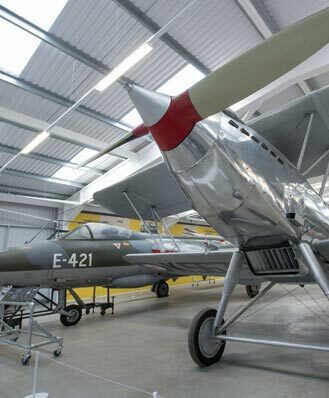 This aircraft was first flown from Brooklands on in 1964. 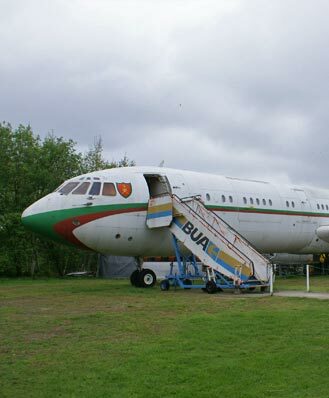 Delivered to British United Airways at Gatwick registered G-ASIX, it passed to British Caledonian in November 1970 and was sold to the Omani Government in 1974. After refurbishment it was operated as ‘A40-AB’ by The Sultan of Oman’s Royal Flight at Muscat. 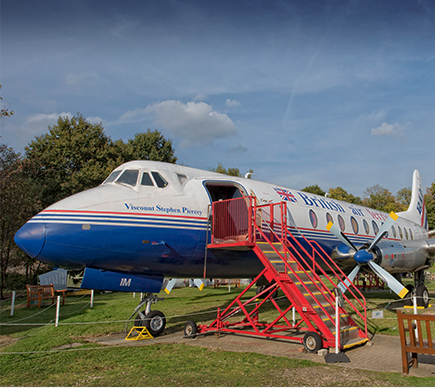 The Vickers Viscount was the world's first turboprop airliner and was one of the few commercially successful aircraft programmes of post-war Britain. 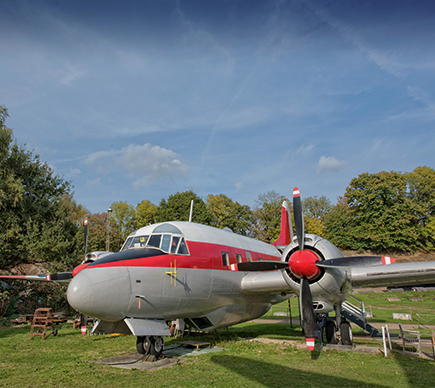 This example was one of the last Viscounts built at Brooklands. The Varsity was an aircrew trainer used primarily by the Royal Air Force. 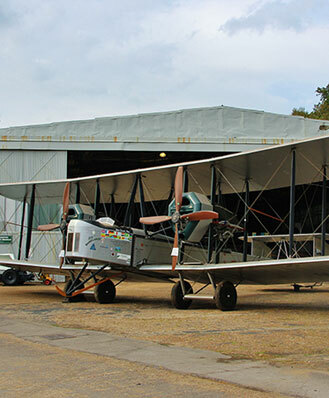 This example was the 18th Varsity built, first delivered to the RAF in 1951.It was purchased by Brooklands Museum in September 1988. The Vanguard was a private venture airliner built to a British European Airways (BEA) specification for high-density medium range routes. 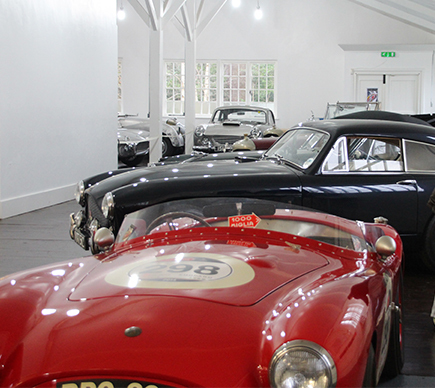 This example first flew from Brooklands in 1961. 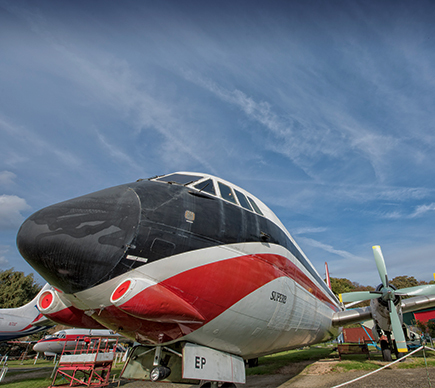 In early 1995, it became the world’s last airworthy Merchantman, landing at Brooklands Museum in October 1996. 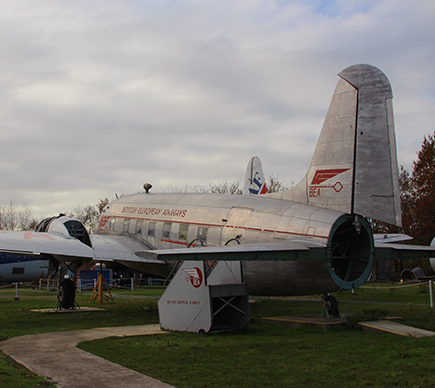 Developed as a civil version of the Wellington bomber, this was Britain's first postwar airliner. This example was the 12th Viking built, and was the second Viking to be delivered to BEA (named ‘Vagrant’). 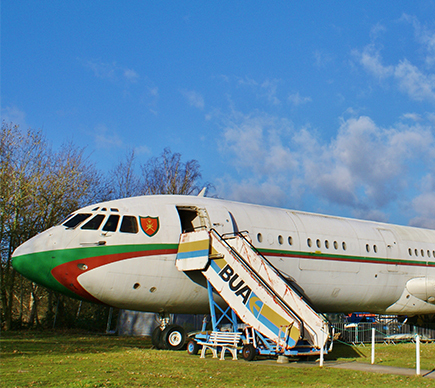 Now the UK’s only surviving Viking, G-AGRU was formally donated by British Airways to Brooklands Museum in 2005. 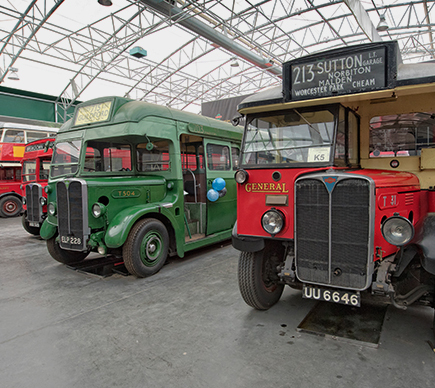 The London Bus Museum, operated by the London Bus Preservation Trust, houses the largest private-sector collection of London buses (1890s – 1970s) in the world and is included in the admission price. 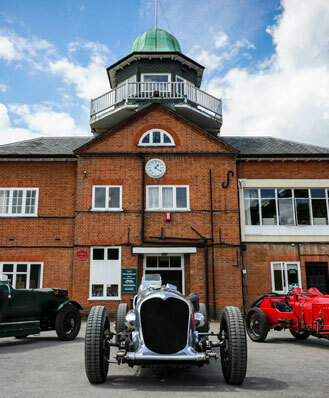 The perfect place to relax and enjoy the ambience of Brooklands Museum within the iconic Clubhouse, the Sunbeam Café offers a delicious range of breakfasts, lunches, snacks and treats, freshly prepared by our chefs.